Natrum Mur available in liquid form for quick absorption. Lacotse free formula. Beneficial for those who are lactose intolerant or have a dairy allergy. Natrum Mur, #9, is the Cell Salt that regulates water balance and water distribution in the body. Natrum Mur is useful in ailments involving water imbalance such as sinus, hayfever, edema, puffy eyes, water retention, and perspiration problems. Dark circles under the eyes indicate the need for Natrum Mur. The book Twelve Tissue Remedies mentions that Natrum Mur may be of value in glaucoma. 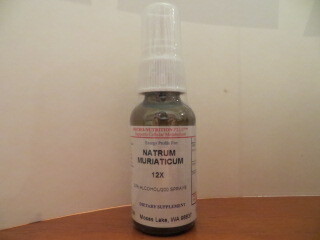 Natrum Mur relieves dry eyes, itchy eyes, poor eyesight. Kali Phos/potassium and Natrum Mur/sodium comprise the minerals that run our cells' "batteries". They are the body's electrolytes. Fatigue is a deficiency symptom of these 2 Cell Salts. Natrum Mur is one of the 12 Homeopathic Cell Salts, also termed Tissue Salts or Biochemic Salts. We sell the original fast acting Schussler’s Cell Salts. Biochemic minerals for cellular health in instant melt-in-your-mouth tablets. Biochemistry developed by Dr. Schussler, is the use of low homeopathic potency to help the body utilize the corresponding mineral more efficiently in the body. Cell Salts are used successfully because they are the foundational nutrition for the body’s enzyme activities and energy cycles. Cell Salts are instantly bioavailable. Natrum Mur is one of the most common constitutional types in homeopathy. This is no surprise considering the extensive overuse of salt and processed foods in our society. Natrum Mur is the homeopathic cell salt form of sodium chloride, so is used to balance excess salt in the system. Natrum Mur supports kidney function and relieves edema, whereas overuse of salt overworks the kidneys and causes edema and fatigue. Natrum Mur balances the important electrolyte of sodium and correctly distributes the mineral sodium chloride in the body. If you suffer from lack of energy, depression, and/or excess sensitivity look to Natrum Mur. Other benefits of Natrum Mur include coughs, skin problems, high blood pressure, and slow digestion with heartburn. Natrum Mur is used for a headache that begins at the root of the nose and extends to the forehead and is associated with nausea. Headaches and migraine symptoms helped by Natrum Mur include: Throbbing, blinding headache as if hammers going off in the brain. Headache from eyestrain, from anemia, from colds; blurred vision that is worse looking down or with flickering lights; with backache. For acute problems such as headaches use 3 tablets every 1/2 hour for 4 doses in addition to general dosing. Use with less frequency as improvement is made. Natrum Mur is also known as Natrum Muriaticum and abbreviated Nat Mur. For acute problems such as headaches use 10 drops every 1/2 hour for 4 doses in addition to general dosing listed below. Homeopathic liquid dilution, 1 fluid ounce, in a base of food grade alcohol. You can use liquid cell salts for general health, health maintenance, or for treatment of symptoms.